For the last party of the summer, and to celebrate turning five, Electric Field’s organisers have pulled together one cracker of a shindig! 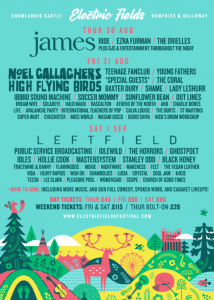 The fifth edition of the festival delivers a thrilling bill which will be topped by titan headliners Noel Gallagher’s High Flying Birds, Leftfield and James. Held within the stunning surroundings of Drumlanrig Castle in Dumfries and Galloway , the festival runs from 30th August to 1st September, and features a myriad of great artists from close to home and from around the world including, CRYSTAL, Wuh Oh, Solareye Teenage Fanclub, The Coral, Young Fathers, Idlewild, Ezra Furman, Ghostpoet, Sunflower Bean, Black Honey, Out Lines, Rascalton, Loki The Scottish Rapper, Stanley Odd, The Dunts, St.MARTiiNS, and much more. Indie stalwarts James will commence headline duties on the Thursday in what promises to be a sing-along greatest hits set as they deliver their back-catalogue. 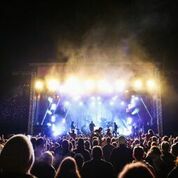 The Chief, Noel Gallagher will surely deliver one of Electric Field’s most rousing performances of the weekend as he brings his arsenal of anthems to intimate Drumlanrig. Whilst electronic mavericks will close the curtain on summer with a stomping, hands in the air set. As well as a staggering musical line-up, Electric Fields are once again expanding their entertainment more quality cross-cultural offerings with the fantastic Neu! Reekie! This year, they will host Darren McGarvey talks Poverty Safari & Loki the Scottish Rapper alongside Cat Hepburn. Thursday sees the likes of Ezra Furman, The Orielles and Dumfries’ Barstow Bats. Friday should deliver thrilling sets from Life, Rascalton and a searing live set from Yorkshire’s Avalanche Party, alongside seething post-punk from Shame, and a dose of gullus ‘cooncil punk’ from The Dunts and another blinding performance from Young Fathers. Feast has been blown away from their recent performances. Quite simply there are no other bands like them just now. Feast picks for Saturday will see the likes of Black Honey perform alongside established acts such as The Horrors, Idlewild who are sure to perform blistering sets. As well as looking forward to a genre-hopping set from Nightwave who fuses her signature punchy sound of acid, Chicago house, Detroit techno and electro. In addition to the amazing lineup, the festival will be holding a heartfelt tribute to Frightened Rabbit’s frontman Scott Hutchinson. Scott was due to perform at the festival with his new music venture Mastersystem. In place of their booked performance, there will be a playback of the band’s debut album ‘Dance Music’. The Friday will also see Frightened Rabbit’s album The Loneliness and The Scream being blasted from the main stage. Let’s raise a glass, a toast and celebrate in honour of Scott. 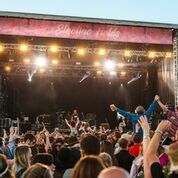 As well as showcasing some of the best female talents around on the lineup, Electric Fields truly have something for everyone in what promises to be another brilliant weekend. See you in the fields!